New Harn Releases: Harnworld & Harndex 3rd ed. 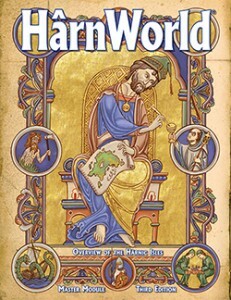 Columbia Games has a new edition of Harnworld and the Harndex available over on their website. Brand new 3rd editions of Hârnworld and Hârndex are now available. These are now 2 separate products. Note: Hârnworld and Hârndex will not be sent to HârnQuest subscribers automatically. HârnWorld is a detailed, realistic, flexible, and system-neutral setting for fantasy role-playing games. Since 1983, HârnWorld has been used by thousands of people across the world to run a wide array of medieval fantasy adventures. HârnWorld can accommodate whatever style of campaign you are looking for, whether your player characters are knights, mages, barbarians, clerics, noble lords, mercenaries, gladiators, craftsmen, merchants, thieves, or even simple peasants yearning for adventure.